Coming January 6th, the eyes of the tech industry will be firmly fixed on Las Vegas as the 49th Consumer Electronics Show (CES) gears up to start off 2016 with a bang. Though CES’s history is littered with products that have flopped or been slow to take off, this grand-scale exhibition of the near future attracts thousands of companies and hundreds of thousands of attendees every January, setting the tone for the year ahead. FoxNews recently reported Gary Shapiro, CEO of the Consumer Technology Association (CEA), that hosts CES, stating that more than 3,600 companies are expected to take part in the event this year. Adding on to that, some 500 startups will be in the show’s Eureka Park exhibit area, up from 375 last year. Being an event this massive in size (CES 2015 recorded an attendance of 176,676), CEA in their effort to offer a quality experience, aims to cap CES 2016 attendance at 176,000. In this blog, we will talk about 5 ways in which CES 2016 can use beacons to manage such enormous crowds while enhancing all critical attendee touch points and maximizing user engagement. Being an event this massive in size, it is highly critical for event organizers (i.e CEA) to have a sound understanding of attendee flow at the various CES 2016 venues to suggest changes to real-time attendee navigation. This is where heat maps, a beacon-enabled feature comes into the picture. These venue wide heat maps can help event organizers identify attendee movements within the venue, take note of dead spots and areas that are most trafficked to make data driven layout decisions. Adding on to that, because beacons provide critical information such as number of beacon hits within a specified time and attendee dwell time at beacons in real-time, it will enable CEA to accordingly delegate more staff to highly trafficked areas. This combined with the ability to leverage beacons to help with navigation will help event organizers even out the crowd by directing attendees to their desired locations without having to search through such vast event layouts (CES 2016 will take up over 2.4 million square feet across a number of venues in Las Vegas). As the number of events leveraging cutting-edge technologies continue to grow, more and more attendees are already use beacon powered mobile apps for on-the-go guidance, be it at the event venue, public transport or at the destination hotel. But the main pain point here is that, this information is spread across multiple apps. For example, an attendee at CES 2016 will probably have the HotelTonight app, the Lyft app or Uber app and the CES app installed on their phone. This way the attendee already has three different pieces of information to process. An effective solution to this is to make all these four apps share a beacon network and push personalized notifications based on the location of the attendee. Unacast is one such company that is working towards building and powering the world’s largest network of proximity data, which will in turn help brands to get greater sense of the offline profile of attendees than the ones gathered within the silos that are specific to a physical location. For example, once an attendee exits the event venue, a beacon placed at the exit corner will automatically send a push notification asking if he/she is looking for a ride and to type in the destination. Once that is done, it will automatically open up the Uber or Lyft app (depending on which is easily available) thus allowing attendees to request for a ride in a single tap. 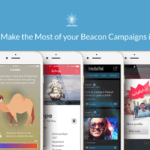 If you too are looking to leverage beacons to ramp up your event marketing strategy in 2016, join us for our upcoming webinar on ‘7 Ways Brands can use Beacon Tech to Make it Big in 2016’. 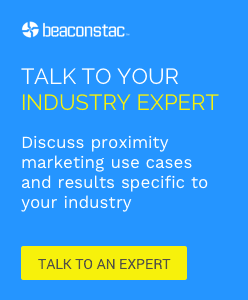 With a quick sum up on lesser known beacon use cases and innovative iBeacon strategies, it will set you up for success in the upcoming year. Register now! Beacons deployed at all the seven monorail stations in Las Vegas, can be used to push relevant notifications on any delay in arrivals or real-time rail schedules. Adding on to that, beacons can also be employed to guide users with directions and advice on where to queue for a ticket. Beacons can help improve networking, one of the primary reasons why people attend events, by providing users a mobile view of other attendees around them. Combining this with Linkedin integration will enable the CES app to match profiles based on attendees’ interests and send them notifications when they are in close proximity to a match. Adding on to that, the CES app can even offer attendees an in-app messaging feature that allows them to initiate the right conversations based on the insights offered by Linkedin. Further, leveraging hyper-local beacons to reveal which attendees around have favorited similar sessions can help events as massive as CES 2016 to hone in on the most relevant users. Currently most CES attendees rely on an event’s official app to plan and maximize their experience. It’s an effective way to personalize their schedules, prioritize their time, and get to where they need to be. Beacons can help enhance this by adding another layer to real-time attendee updates that are sure to reach the right attendees based on their location. This will help CEA to manage inevitable scenarios such as session changes or last-minute ticket releases by pushing notifications to nearby attendees, making it easy to communicate these changes in the most relevant way. Being one of the early adopters of iBeacon technology since 2014, CES has always pushed envelope harder when it comes to using innovative event technologies. The CEA recently confirmed that they will be holding a beacon powered scavenger hunt at CES this year to offer enhanced attendee engagement at the venue. We here at MobStac are excited to see how CES plans to use gamification to make attendees swoon in delight. What do you think about the above suggestions? Do you have any other ideas on how CES 2016 can use beacons to manage crowds better while offering an enhanced event experience? Let us know in the comments below. Good article.. Though i will be interested to see mixed reality in combination with beacons!!! where by implementation of holographic overlay will be faster and easier with beacons and avoidance of too much of programming to make the holo effective and many more to come!! !